What is the GA? 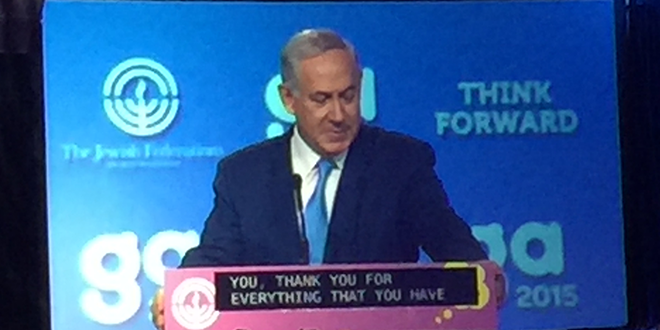 Every year, our partner, the Jewish Federations of North America (JFNA), annually hosts the General Assembly. 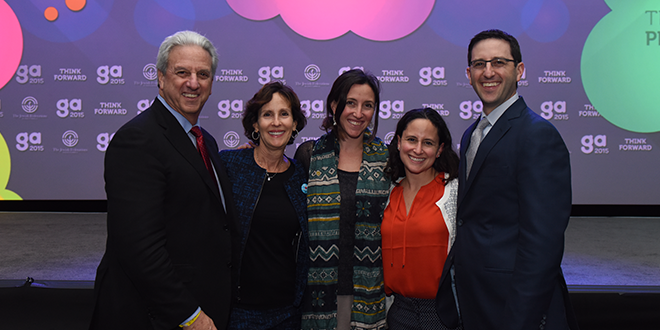 This 3-day premier leadership experience engaged Federation volunteers and professionals, and those engaged in the business of Jewish philanthropy. 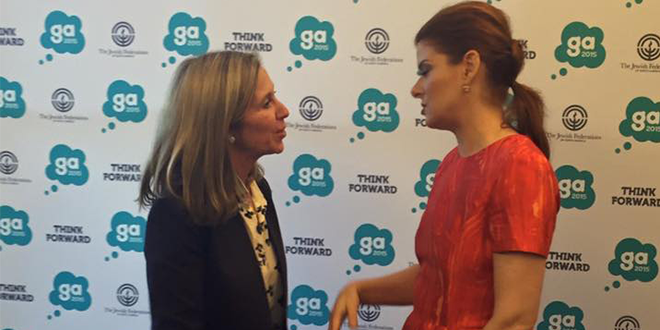 This year's GA featured top figures like Israeli Prime Minister Benjamin Netanyahu, philanthropic thought leader Dan Pallotta and award-winning actress Debra Messing. Plus, thousands of changemakers shared best practices and celebrated the extraordinary work of the Federation movement. 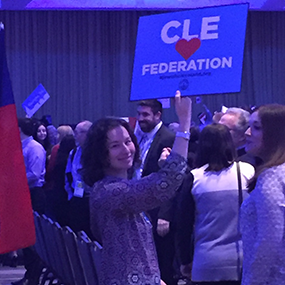 Hear from Cleveland Delegates, as they share their experiences from the 2015 GA in Washington, D.C.
Federation staff and community members show their #JewishCleveland pride at the GA Opening Plenary! Our own Federation staff were in the spotlight at the event, with presentations by our Managing Director of Information Technology, Dan Strom, and Managing Director of International Operations, Ilanit Gerblich Kalir. Plus, our Managing Director of Marketing and Communications, Dahlia Fisher, was featured in a video segment about telling Jewish stories. 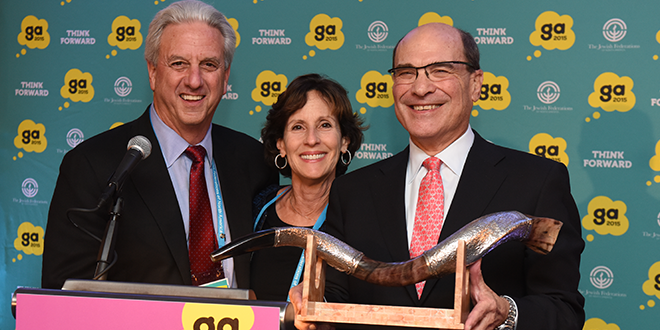 Mazel Tov, Michael Siegal, who was recognized at the GA for serving a three-year term as JFNA Board Chair. Michael honored for his leadership, surrounded by his Cleveland friends and family, and Federation leadership and volunteers from all around the country. “The Federation must always remain a safe place for robust and respectful dialogue,” said Michael. Top figures from around the world spoke on the GA stage this year. 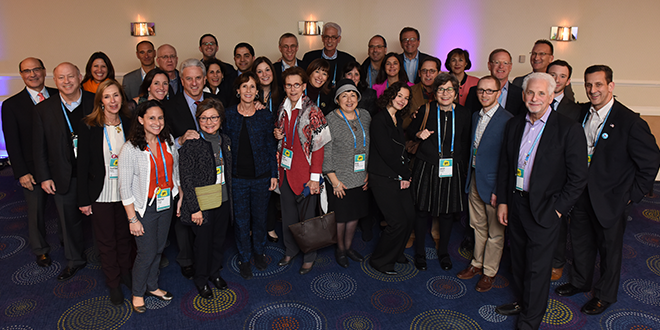 At the Opening Plenary, the Delegation had the opportunity to hear award-winning actress Debra Messing, who shared a moving story of meeting Holocaust Survivor Gerda Weiss Klein. Cleveland Board Member Suellen Kadis had the opportunity to later meet Messing, who continues to be committed to a life of service and tzedakah. 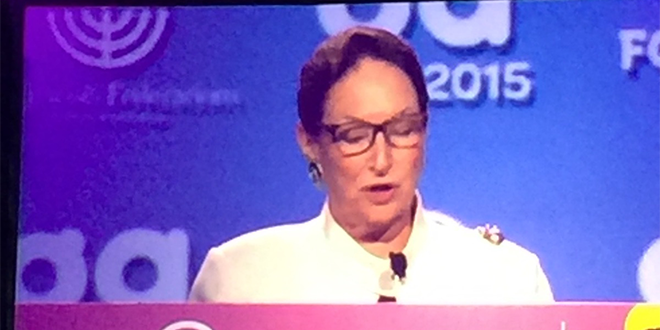 Another groundbreaking speaker was Judge Rosalie Abella of the Supreme Court of Canada. A daughter of Holocaust survivors, Abella courageously shared her story at the GA. She said, "One of the legacies of having a Holocaust background is that you never stop thinking about justice.” To watch all the Plenaries, visit www.generalassembly.org. Cleveland Delegates who attended the GA share their favorite moments and highlights! 1. What are three adjectives you would use to describe the GA? 2. Why was it important for you to attend this year’s GA? We are at a critical time is U.S. history with the upcoming elections, the Iran deal, the political tension among the Jewish people as it relates to the bipartisan support of Israel and I wanted to be at the GA to hear the perspective of the top speakers on these issues. 3. What was one moment you’ll remember from this year’s GA? Heading David Gregory's plenary about faith after having just lost his father a few days ago. 4. What has been the best part for you? 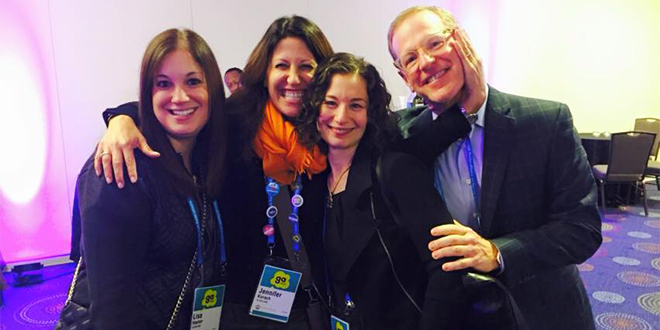 Connecting with 3,000 Jews from around the globe that are dedicated to learning, connecting, and bettering the global Jewish world. 5. What would you tell someone who is considering going to the GA next year? There is something for everyone to learn and be inspired by at the GA.
1. What are 3 adjectives you would use to describe the GA? 2. Why was it important for you to attend this year’s GA? 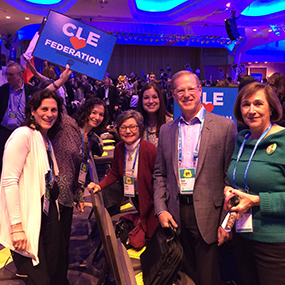 It is important for the rest of the Federations to see the strength of our Cleveland community. Michael Siegal, who just concluded a three-year term as JFNA Board Chair, has brought so many accolades to Cleveland these past 3 years, it is important for our contingency to show up with powerful numbers. 3.What is one moment you’ll remember from this year’s GA? The opening plenary’s speakers were incredible. David Gregory sadly lost his father two days prior to the GA and spoke from the heart about the power of faith and connection to family. His words and raw emotion was felt by the every single one of the 3,000 attendees in the crowd. 4. What has been the best part for you? As a Vice Chair for National Young Leadership Cabinet, I was excited to see my fellow Cabinet members and learn together through an exclusive leadership training session on Sunday at the GA. 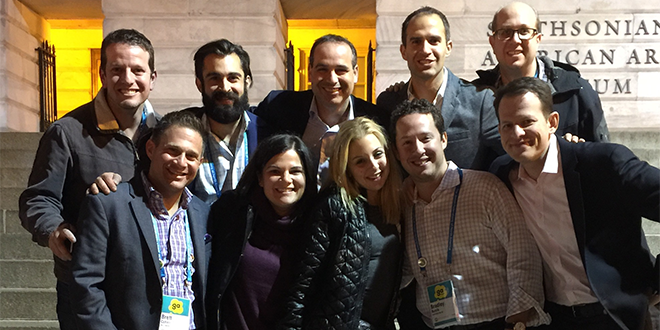 The network and friendships I have made with other young leaders throughout the U.S. and Canada is truly priceless. 5. What would you tell someone who is considering going to the GA next year? GO! Every session is better than the next. The connections and resources you will encounter from Jews across the globe is worth the trip. You will not regret it, in fact, you will want to attend every year going forward. It’s a first class conference that never disappoints. To learn more about the GA, view a photo steam, and more, visit www.generalassembly.org.